"Breaded and pan-fried zucchini is a quick and easy side for meat, or you can serve it as a vegetarian main with other vegetables and a salad." Rub zucchini slices with garlic. Place flour, egg, and bread crumbs separately in 3 small bowls. Turn zucchini slices in flour, dusting off excess. Dip in egg and turn in bread crumbs. 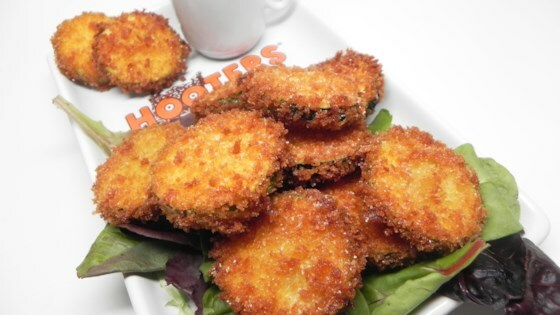 Heat oil in a skillet and pan-fry breaded zucchini in batches on both sides until lightly browned, about 5 minutes. This turned out good but plan on more breadcrumb. 2 tablespoons isn't nearly enough. I used Panko because they are my favorite. This was easy and one I will make again.